Great colors. Looks perfect on my patio. It matched the other décor so well it looks like I bought them together. Dimensions 66.0 In. X 42.0 In. X 0.25 In. Option: Aqua - 3'6" x 5'6"
I ordered the Aqua rug, but was disappointed to find the background -- which is described as being tan -- is really tan and RED (!!). This is not visible in any of the photos shown with this product, but I'm including photos of the rug that I have taken so that you can see just how obvious the color is. I'm really not sure why the manufacturer would use red threads in this rug. I am returning immediately. It has too much of a holiday feel for my outdoor patio. Yuck. This is a quality made area rug. The colors are just as the picture shows, bright teal and cream background. I placed it my 4 season porch and it gets a lot of traction. Vacuuming the rug is a breeze or it can be shaken outdoors. Option: Orange - 3'6" x 5'6"
Nice outdoor rug. Durable and waterproof. Keeps its color. We are happy with the design and color of this rug but it is a little disappointing if you are expecting a plush rug. The areas of color are soft but the neutral space is not carpet at all. It seems more like a burlap rectangle that some woven fibers around the edges. So Pretty / So Affordable! 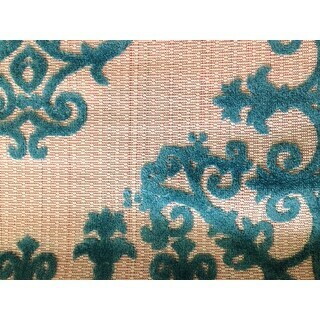 Option: Green - 3'6" x 5'6"
Option: Navy - 3'6" x 5'6"
This is a very attractive rug. It is well made and durable. The pattern is appropriate for tropical, coastal, or French country decor. It is a uniqe pattern which catches the eye. The light background brightens the room. This rug comes in a variety of colors. I love it in my family room. It would be good for a patio room, also. It is my favorite rug. 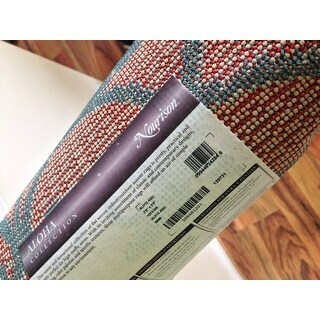 This rug is very pretty in person, great quality and the color was perfect. The only reason I gave it 4 stars instead of five is because the sizes it comes in are odd. It didn't fit in the area I needed (too small) but I really wish it had because it was gorgeous. Great front door area rug. 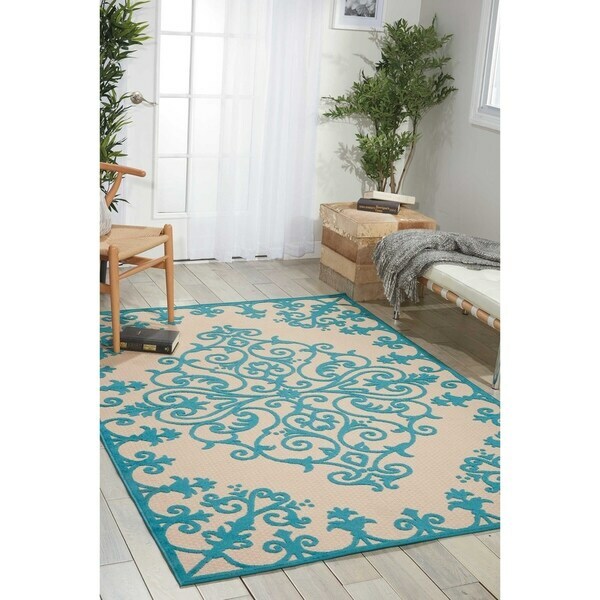 This is a very nice, well-made rug with a quality look and feel - not something I expected in an outdoor-grade rug. Sweeps clean easily and is very good looking on my porch. It's a very pretty little rug. Loved this outdoor carpet. Purchased the navy blue one. Looks very elegant with my patio furniture! Going to order another one for a different area on my deck. Beautiful rug. Arrived in good condition and looks just like the picture. We loved it enough to order a second one. Absolutely beautiful. Colors are vibrant. I use it as a mat at my front door. Option: Red - 3'6" x 5'6"
very cute. turquoise color was not quite as bright as represented in the photo but worked well anyway. quality is good and it looks nice with my patio furniture. I purchased this rug for my deck. It goes well with the decor I already had in place. Everyone asks where I purchased it from. It's so inviting and goes well with the tranquil feel I wanted to create. "Is the green close to a limegreen color? What sort of green is it? It says green option but I can't find one "
"Can you clean this rug by spraying it off with a garden hose? How do you clean this rug?" I use a blower on the rug daily We also pull out the vacuum cleaner for BIG spills before the ants invade. Yes garden house if nessassary but the rain usually cleans it then you just need to use blower! Was hoping for a bright Christmas Accent and this one was inexpensive enough to take a chance on! !